Following is my testimony before the Alaska Senate Community and Regional Affairs Committee in support of SB13, a bill that would would ban “material support or resources” to the NSA. 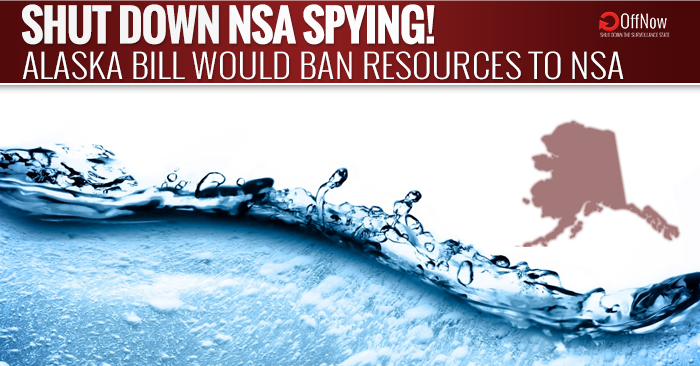 The resolution also called on the federal government to end mass warrantless collection of electronic data. Here we are, another year down the road, and Congress still hasn’t taken the first step to stop unconstitutional spying. Let that sink in for just a moment. That was 40 years ago. Before everybody used cell phones. Before everybody used email. Before everybody was plugged into the World Wide Web. If the potential for total tyranny existed in 1975, where are we today? And yet, Congress has still not taken any action. It’s had 40 years. I think it’s safe to assume Congress isn’t going to act. That’s why it’s imperative that the Alaska legislature take the next step, heed the words of last year’s Senate resolution, and end state assistance to unwarranted federal surveillance. SB13 is the appropriate next step. In 2013, Gov. Sean Parnell signed a bill into law that prohibits the state from cooperating with federal implementation or enforcement of certain programs that infringe on a person’s right to keep and bear arms, the right to due process or that would aid in the implementation of the federal REAL ID Act of 2005. SB13 expands this unchallenged state law to cover our natural right to privacy. Alaska law enforcement has expressed opposition to SB13 saying that it will reduce cooperation with federal law enforcement agencies. It is my understanding that amended language has been drafted to clarify that the legislation only prohibits state support to federal agencies involved in the routine surveillance or involuntary collection and storage of bulk telephone or email records without a warrant. This should eliminate any concerns voiced by law enforcement. Continued opposition amounts to an admission that they know – or at least suspect – that they are cooperating with agencies engaged in illegal, unconstitutional surveillance. Otherwise, they would have nothing to oppose – because this law would never have to be implemented. The refusal to cooperate ONLY applies to bulk, warrantless surveillance. If the feds aren’t doing this, then law enforcement has nothing to worry about. Perhaps that explains any continue law enforcement opposition. Or perhaps they simply fear that rocking the apple cart will jeopardize federal grants, asset forfeiture money or access military surplus equipment. Either way, we should not sacrifice the most basic right to privacy on the altar of cooperation. Today, you have the opportunity to do what Congress has failed to do for 40 years – protect the privacy of Alaskans, preserve the Fourth Amendment and help rein in an unaccountable and out of control federal spy agency. I urge you to vote yes on SB 13.